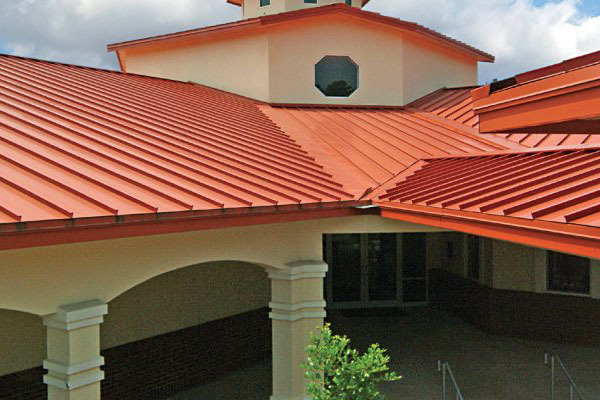 There is only one category of metal roof systems used in low-slope applications-Structural Metal Panel. Structural metal panel roof systems can be used for low slope roofs because of their hydrostatic, or water barrier, characteristics. It is important to note structural metal panel roof systems can be used for steep slope roof assemblies, too as well. Metal corrugated iron roofing has been used as a building material for over 200 years. Metal Panel Roofing is popular in Chicagoland because of its durability, relatively lightweight, and has great aesthetical appeal. Almost half of all Chicagoland roofs constructed today in the low rise, non-residential market are metal roofs- principally pre-engineered metal roofs. Steel erectors, not roofing contractors, install most of these metal roofs. The most common material is galvanized steel, occasionally with a colored, baked enamel finish. There are also many aluminum systems on the market today. Once installed and the metal panels have been on the Chicagoland building for some time some sources of trouble arise from foot traffic, air handling equipment, and from wear and tear from the weather. There are temporary repairs that can be made but to some extent they almost always re-occur. If your Chicagoland roof is leaking and the damage is beyond a minor repair it is best to consider the option of a single ply roof overlay. A single ply roof system can be installed in most cases using a flute filler made of rigid insulation board and either mechanically attaching, or fully adhering the Single Ply roof to both the metal panel and the insulation flute filler area. If the Metal decking material is less than 22-gauge we would recommend a 1/2” cdx plywood over the metal deck. Now would be the perfect time to consider increasing insulation using rigid foam prior to the install of the Single Ply Roofing System. There is always the consideration of a total metal panel roof removal and replacement.